Kidpreneurs Interview: Joshua and Zachary Neyens of Buggie Bag - Kidpreneurs - Young Entrepreneurs with Big Ideas! As we often say here at Kidpreneurs, “It’s never too early!” And we recently met a couple of Kidpreneurs who prove that point. 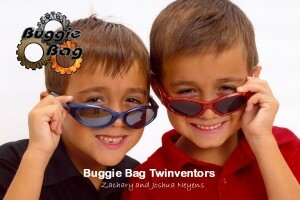 Twin brothers Zachary and Joshua Neyens invented their breakthrough product, Buggie Bag, when they were just six years old. Since then, the product, which is a designer dust cover for dune buggies and other recreational equipment, has really taken off. Josh and Zach have been all over the news, and their customers love the product and can’t get enough of them. Now nine years old, these brothers are an inspiration to any Kidpreneur out there who wants to start his or her own business. They’ve proven that age doesn’t have to be a factor in your success, and that great ideas are in no way limited to adults. Enjoy the interview, and be sure to congratulate the guys in the comments section! Kidpreneurs: You came up with the idea for Buggie Bags at the age of 6. Did you think of the idea with the hopes of making a business out of it or just for your own use? How did the business grow to where it is today? Josh: At first we just wanted to make one for our dune buggy, but then everyone wanted one. Then we wanted to do it for a business. Our dad is a marketing king, so he helped. Kidpreneurs: What has been the biggest business challenge you’ve had to face, and how did you overcome it? Josh: Keeping up with the demand for our product. We can’t make them fast enough! But our grandma Lodi and grandpa King loaned us money for making bags. 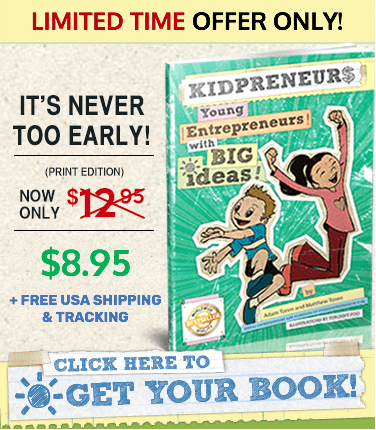 Kidpreneurs: Are your parents entrepreneurs? 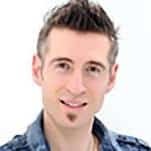 What have they taught you about running a business? Josh & Zack: Well, our mom and dad are both creative people. My dad was a rock singer and in the movie business, and my mom is in the music business. We learned that supply and demand is important, and about the value of money, and that board meetings are called that because they are really boring – omg! 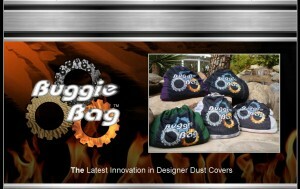 Kidpreneurs: What’s it like to have the attention you’ve gotten for inventing and successfully marketing Buggie Bags? Is there any pressure, or is it mostly a lot of fun? Zack: We’ve been in lots of papers and on the news since we were 6, so it seems normal to us. We have lots of fun watching people use our product. It’s so cool, and our dad only makes us do what we want, and he does the rest. We think it’s cool to have or own business. Kidpreneurs: What advice do you have for Kidpreneurs interested in starting their first business? Zack: Go for it! It’s fun, and your mom and dad will help you. There are so many new things to come up. Josh: Do something you like to do so it’s fun for you. Zack: Don’t be afraid to try. It seems scary, but it’s not. Zack & Josh: We want to run our Buggiebag business always, till we make enough money to buy a bakery and buy a huge house in Las Vegas – maybe when were old like 16 or so. Jay Neyens (Dad): I think both boys have really benefited from the experience of taking an idea in the garage one day to making that idea a product on the shelf. They have respect for money and understand you can achieve anything you want, as long as you have a plan and the motivation to achieve it. Not only are our family and friends proud of the boys accomplishments, but people stop us on the street a lot and tell us we have showed them the American dream can still come true. It also gives the boys confidence to try anything. Sometimes you will win, sometimes you will lose. The reward is in trying at all. They sell their product around the world and have the most innovative product in the storage industry. Good for them!